Aberdeen City Council has admitted to a "serious failing" after repairs worth £200,000 were ordered to a cycle path without proper approval. Work at the path involving a boundary wall on Wellington Brae in the Ferryhill area has been suspended while an investigation takes place. Council finance convener Willie Young said he and his family had owned the land in the past, but not currently. Mr Young, a Labour councillor, has denied any wrongdoing. The council said approval for the project did not follow the required governance procedures and was not presented for committee approval. It said an urgent review was under way. The path is cordoned off but no repair work is taking place. The project was to be fully funded by cycling charity Sustrans, which awarded just over £21,000 for preliminary work, with the full funding to be paid when the work was completed. 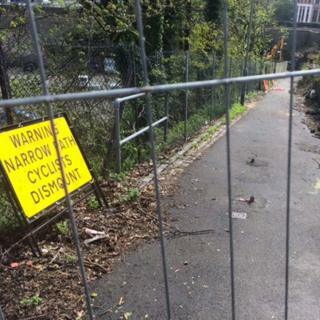 Bernadette Marjoram, Aberdeen City Council's interim director of communities, housing and infrastructure, said: "The Wellington Brae cycleway repairs were first considered by officers of the council in 2016 following storm damage. "Aberdeen City Council acknowledges the project did not subsequently follow the required governance procedures and was not presented for committee approval at any stage in the process. "This is a serious failing by council officers and therefore an urgent review is under way. In light of this, work has been suspended." She explained: "The project, which was to be fully funded by Sustrans, was instigated by staff of the planning and sustainable development service in conjunction with Sustrans on the basis the section is part of a national network. "It should be stated no works were requested by landowners in the area surrounding the path and nor did any landowner seek funding for repairs. "At this stage the ownership of the land is in question. Aberdeen City Council is urgently seeking to establish clarity in this respect. "To reiterate, no elected member of Aberdeen City Council was given the opportunity to consider the Wellington Brae project at committee or was party to any decision taken." Local SNP councillor Graham Dickson said: "This revelation needs to be fully investigated to ensure there has been no misuse of public funds. "This decision appears to have bypassed all public scrutiny and we need to know who authorised what and why." Tom Mason of the Scottish Conservatives said: "This appears to have been a failing in process on the part of council officers, and it is right that a proper investigation is carried out internally. "I think most local residents would be surprised that the council cannot identify who owns the land in question. Officials must get to the bottom of this as soon as possible."